Cool off with a Blackberry Gin Slush this summer! This cocktail mixes frozen blackberries with ginger ale, mint and gin and makes a delightful, chilled creation that’s hard to stop sipping. In my years of blogging — nearly five here, plus an additional few at a personal blog that was named after a comment my media ethics professor made about my handwriting — I’ve had the pleasure of meeting and connecting with so many different bloggers. I’ve had the fortunate of meeting several blog friends throughout the years, and I hope to meet more of them in the future. The bad thing about all of us connecting on the Internet means that more often than not, we can’t get together in person because we live in different cities. And that breaks my heart because there are so many people I want to hang out with on a regular basis. The only problem is they don’t live anywhere near me. So today, my pal Susannah and I have organized 50 of our blogger friends to create the Great Blogger BBQ. Our barbecue is a nod to the unofficial start of summer, which is this coming Monday. And it’s a potluck. We’ve all brought different dishes to the par-tay. Some of us have made entrees, others desserts, a few appetizers, some sides and others, like me, have mixed beverages. My beverage? It’s of the boozy variety. I wanted to make a drink for us to enjoy on a hot summer day. The temperature is rising in Texas, and it won’t be long before it’s scorching here. My only caveat was that I wanted to create a light, flavorful drink that would keep us cool without knocking us on our butts. Because while I enjoy a good boozy drink as much as the next person, I’ve officially decided hangovers are for the birds. And by birds, I mean 21-year-olds testing their tolerance. This Blackberry Gin Slush recipe makes THREE drinks! It’s light on the booze, but heavy on the summertime flavors of mint and blackberry. And you can make it in your blender. If that’s not an delightfully easy cocktail for a backyard barbecue, I don’t know what is. Now, let’s talk about the Great Blogger BBQ! It’s almost barbecue season! 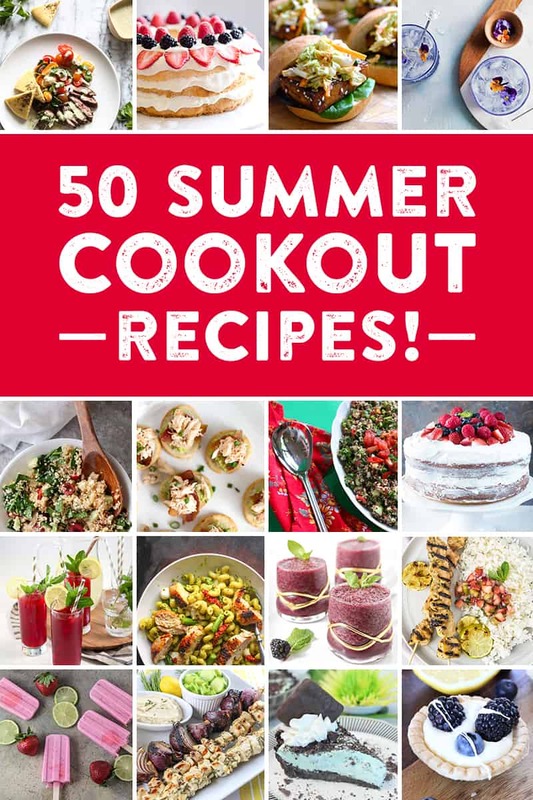 In celebration, I’ve teamed up with my blog friends to bring you 50+ recipe ideas for hosting (or attending) a smashing summer shindig. See all the recipes below! Now who wants a Blackberry Gin Slush? Cool off with a Blackberry Gin Slush this summer! This cocktail mixes frozen blackberries with ginger ale, mint and gin and makes a delightful, chilled creation that's hard to stop sipping. In a saucepan over high heat, pour in the water. Add the granulated sugar and sprig of mint. Bring the water to a simmer, stirring constantly until the sugar has dissolved. Take off the heat, and bring to room temperature. Store in the refrigerator in a mason jar or a plastic container until use. In the blender, combine the ginger ale, frozen blackberries, mint simple syrup, gin and mint leaves. Blend until smooth and a slushy consistency. Serve immediately with a sprig of mint. If you want the cocktails to be boozier, add 2-3 additional oz. of gin. I could taste the gin in these light drinks, but you can certainly add more if you desire! What are you cooking for Memorial Day weekend? Oh my good grief! Grown up slushies, FTW!! Grown up slushies, indeed, Alida! Cheers! Can you IMAGINE if the blogger BBQ were real?! It’s be the tastiest, quirkiest event ever! Uggggh, I want to attend a 50-deep blogger BBQ like WHOA! These blackberry slushes look fabulous! The boyfriend and I will have to make them over the weekend fo sho! I wish we lived closer and meet in person! Anyway, all 50 recipes sound incredible, I feel so lucky to be part of this! Your blackberry gin slush looks super tasty, beautiful and refreshing. Love it! Gorgeous pictures!! Those glasses with the gold around them are so cool! Erin, I am SO glad you organized this lovely BBQ party–it makes me want to get all my blog friends together in real life all the more 😉 This slush looks amazing and refreshing and I bet that simple syrup would be fabulous in lemonade! Want, want, want this blackberry gin slush! Definitely a perfect cool-down cocktail for the summertime. And that gorgeous color?! Swoon! I might have to drink all 3 myself and make another batch for everyone else 😉 Pinned and cheers! Where to start? First, I want the drink. Then I want the glass. Finally, I want to know the name of your other blog named after your handwriting! Seriously…. What a gorgeous drink! The colors are so pretty. And I’m in need of those glasses too. Beautiful pics! This drink sounds so refreshing and perfect for a summer bbq. Girl, that is one beautiful cocktail! I need to add this to the list of new adventures to try and share during the holiday weekend! What an awesome little cocktail Erin! The perfect little cool down for those hot summer days! So glad I got to be part of the Great Blogger BBQ! Thanks so much for including me! I’m so excited for summer and berry season! I need to try a virgin version! The drink itself looks amazing, but I can’t take my eyes off those glasses!!! What an awesome roundup! I love that these can be made in the blender. Nothing is better than a cocktail that comes together with the flick of a switch 🙂 I can already see these in my future! It’s always a treat to get to hang out with other food bloggers. I’m lucky that I live near Susannah so I get to see her on occasion! The only thing that is better than hanging out with food bloggers is hanging out with food bloggers AND drinking a delicious cocktail. This one looks amazing! Will be trying it as soon as I get my hands on some fresh blackberries! First let me say that I am in love with your glasses!! Second this cocktail is going on my summer must have menu! Thanks so much for the invite to be part of the great Blogger BBQ Erin! All these recipes look amazzzing, and I can´t wait to try your blackberry gin slush! YUM!! Wowza, this drink is GORGEOUS, Erin! The color is fabulous and I’m a huge fan of blackberries and gin! This is the perfect libation for celebrating the extended holiday weekend! Can’t wait to try this, girlfriend! Pinned! Thank you so much for putting together the Great Blogger BBQ!!! Such an honor to be included! Cheers to a fabulous Memorial day weekend! Whaaaaaat – blackberries, gin, and mint are three of my favorite things about summer. Yes, please! This is my kind of slushy!!!! I can’t wait to try this! I am having a girl’s weekend coming up and this will be perfect! Pinning now!